Addresses are listed by province on this page. If you cannot find the information you need, please contact our staff. If you need assistance to arrange an orphanage visitation, please contact our staff. 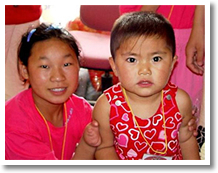 The orphanage addresses are provided to the adoption community as a free service for private use only. Usage for commercial purposes without the permission of Lotus Travel, Inc. is strictly prohibited. Information will be updated regularly and we sincerely invite you to visit our Web site periodically. Send your comments to Lotus Travel.